For additional information about the Airborne Monument at Oosterbeek click on 'Comments below. 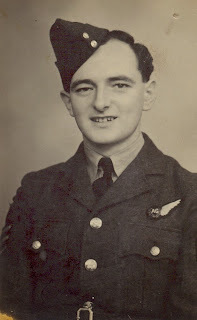 Sergeant John Gregory Woods, RAFVR, of 101 Squadron, whose photograph can be seen above, was one of nine airmen lost in the vicinity of Voué (Aube), France on 4 May 1944. Eight of the airmen belonged to 101 Squadron of the Royal Air Force Volunteer Reserve, while the ninth airman belonged to 166 Squadron. The village of Voué is located in the Champagne - Ardenne region of France and is far from the main First World War battlefields of the Western Front and the Second World War battlefields of Normandy and Provence. "Mens agitat molem" ("Mind over matter"). 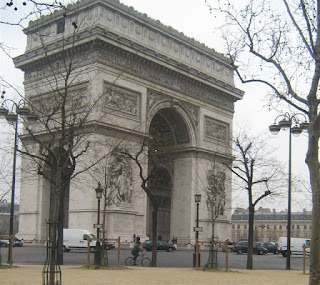 The Arc de Triomphe and Notre Dame Cathedral, Paris stood as silent witnesses to the German Occupation of Paris between June 1940 and August 1944. They also witnessed the Liberation in August 1944, marked initially on 24 August by all the church bells ringing out in the first time for four years. After some fighting in the streets on 25 August, the French capital was liberated. 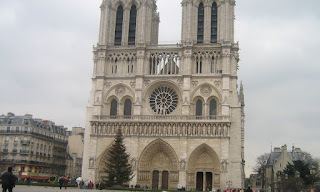 The following day - Saturday 26 August 1944 - General Charles de Gaulle made his triumphal entry into Paris, walking from the Arc de Triomphe down the Champs Élysées and eventually to Notre Dame Cathedral where the 'Magnificat' was sung. Was this was De Gaulle’s finest hour? Personally, I think it probably was - certainly during the war and all that had happened in the previous four years. Monsignor Pierre-Marie Théas, Roman Catholic Bishop of Montauban, Tarn-et-Garonne department, (1940 - 1947) was one of a number of French bishops and clergy who openly spoke out in opposition against the Nazi ideologies during the Second World War. In particular, from the summer of 1942 onwards Monsignor Théas and other bishops condemned the internment of Jews, breaking up of families and deportations to concentration camps, which were being carried out by the Vichy-based French government under Marshal Philippe Pétain. In 1942 Montauban was in the 'Unoccupied Zone' under the direct control of the Vichy government. After November 1942 the Nazis moved in to the previously 'Unoccupied Zone' and took increasingly more control of the area. In 1944 Monsignor Théas preached a sermon in the Cathedral at Montauban condemning 'cruel and inhuman treatment' being meted out against individuals. The following day the Gestapo arrived and Monsignor Théas was himself deported to a concentration camp for 10 weeks, before being returned to Montauban. I have added the audio link to Chamberlain's broadcast, and to the immediate announcements which followed it, in our permanent links' column on the right. These prisoner category emblems were used from 1936 to 1942. 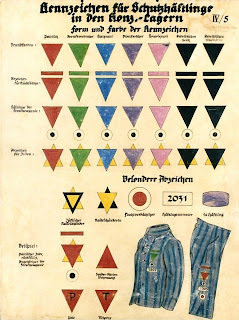 Triangles of various primary colors (grundfarben) were used to identify each category of "undesirable": red for political prisoners, green for criminals, blue for immigrants, purple for Jehovah's Witnesses, pink for homosexuals, black for anti-socials, brown for Gypsies, and yellow for Jews. To these triangles other classifications were indicated with strips and dots. Rückfällige: Recidivist or repeat offender, coloured strip above triangle. Strafkomp: Merits special punishment; punishment battalion inmate, black dot in a white circle. Fluchterverdächtiger: Likely absconder, red dot in a white circle. Jüdische Rassesschänder: Jewish race defiler, sexual relations with an Arian female.